A person’s eye color can be as varied as the reasons people want to change it. Like a fingerprint, no two people’s irises (the part of the eye providing it’s color) have the exact same coloration and texture. We get our unique iris coloration from three sources. 1) The amount of pigment (melanin) contained in the iris epithelium (the back surface), 2) The amount of melanin in the iris stroma (the front surface), and 3) The density of our melanin cells. There is no blue or green melanin cells, melanin cells are always dark brown to black. The coloration of ones eye is a result of how these three layers of melanin pigment reflect and scatter light. In general, the more melanin the darker brown the eye, the less melanin the lighter blue or green the eye. So in a way, we all have blue eyes, but for some people their blue eyes are simply hidden by extra melanin pigment. 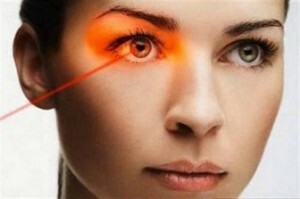 Which brings us to a new laser technique reported in the news being performed which permanently changes a person’s brown eyes blue. But is it safe? The theory is simple. If the level of melanin on the iris is responsible for brown eyes instead of blue, why not use a laser that can remove some of the surface melanin which will allow the iris to reflect the color blue? Dr. Gregg Homer, of Stroma Medical, who pioneered the procedure stated to CNN “ If you take pigment away, then light can enter the iris stroma, the little fibers that look like bicycle spokes. And when light scatters in the stroma it reflects back only the shortest wavelengths and that’s the blue.” The procedure has not gained FDA clearance in the US, but is being performed in several South American countries such as Mexico, Costa Rica, and Panama. Dr. Homer of Stroma Medical goes on to say that “It’s difficult to work out a way to injure someone with this laser because the energy is so low.” However, it is not the laser itself doctors in the U.S. are worried about, but the after effects of the procedure. Another procedure, developed by Steller Devices, uses a physical colored disc as an implant to lay over the patients own iris. In essence, this disc acts like an implantable contact lens. However, this procedure comes with considerable risk. Dr. James Tsai from Yale University states “Some online discussions say the procedure is safe, claiming the technology used is similar to that used to treat cataracts; this is inaccurate as well as misleading”. He is working with the American Glaucoma Society to educate potential patients that this procedure can led to glaucoma by altering normal ocular fluid channels as well as a variety of other problems. At the moment, the only proven safe and effective treatment to change your eye color is through contacts lenses prescribed by your eye doctor and maintained with proper follow-up care. Even over-the-counter colored contacts lenses, which are actually illegal to sell without a doctor’s prescription, are not completely without risk. Infection and permanent sight-threatening scarring can occur if not properly fit and cleaned. So before choosing to change your eye color based on something you have seen advertised on the internet, speak to your eye doctor about the options to be able to make the most well informed choice. Your eyes and eyesight will thank you.